We bought a small house 8 years ago. After a number of weeks of searching and comparing my wife and I picked a Frigidaire Gallery washer dryer combo. The size was perfect for our house 27" wide and 28" deep with the dryer. It has 4 choices for water, hot/cold, warm/warm, cold/cold, & warm/cold. Although we have used it almost entirely on the cold setting. It has 3 water levels and 4 wash settings. Soak/prewash, regular, perma press, and knits/delicates. We have put it through alot of use in those years and it still runs as good as the day we bought it. Although these days we only do about 5 loads a week now when we first got it my step daughter was still living with us. At that time we would do at least a load a day. Even though it doesn't take much room it handles loads that would break many commercial machines I've used. It's a very quiet running washer too. Many times I've carried a load of clothes in to wash and not even know it was running until I was a few feet away. I'm a bus driver and have a number of shirts with logos and printing on them that still look great after numerous washes. From the heaviest load of jeans or towels to my wife's most delicate blouses everything comes out looking fantastic. I bought this unit 14 years ago; I needed something to fit in a small area when I redesigned my kitchen/pantry area, but I also wanted a top-loaded washer big enough for large loads, and a gas dryer which would dry those large loads efficiently. This Frigidaire combo is the best appliance I have; not a single thing has gone wrong in all 14 years of use. I like how it washes my clothes and towels and I like how the dryer does its job too. Don't know what I'd do without this machine! I dread the day when eventually something goes wrong, but I urge anyone looking for this kind or product to consider seriously this one. Congrats to Frigidaire! My washer/dryer was just over 1 year old, aka just past warranty and the dryer is now broken. I believe it needs a new belt but it makes a terrible noise and the drum doesn't spin. Go for something better. Please help. I turned the knob on my dryer too quickly and now it has cracked and I can't turn on the dryer. I don't know what to do. My husband owned the washer/dryer combo when we met five years ago. We moved into a smaller home together, so space was at a premium. I left my washer and dryer and we kept the combo. It was a good decision. 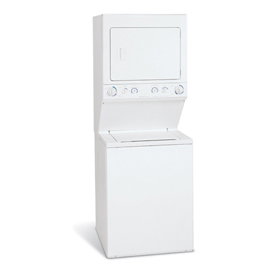 The washer/dryer combo is a large capacity washer and a large capacity dryer. They hold as many clothes as my separate washer and dryer did and can handle the loads as efficiently. I have been very happy with the performance. We have even moved once since our initial move and we had no problems with moving the combo and no problems setting it up in our new home. In fact, if it were not for the combo, we could not have put a deep freeze in the utility room, and we desperately needed the space. I have two teenagers, so laundry is constant. The Frigidaire combo has been dependable. It has never broken down in the six plus years it has been owned. It washes well and dries clothes quickly and safely. I have not had any problems with torn or worn fabric from either the washing machine or the dryer. There are several different cycles available, for knit and delicate fabrics, whites and colors, and the same is available for the dryer. The only drawbacks I can think of at all is that when you are moving the clothes from the washer to the dryer, the clothes have to be lifted out and up, and it feels crowded compared to just tossing them over like I used to with a separate washer and dryer. The other drawbacks are the knobs. In particular, the knob that turns the dryer on is used frequently and it has deteriorated and cracked. I have to push it and twist to get the dryer on. There may come a time in the near future when the knob quits working all together. With these two exceptions, I have been 100% satisfied with this washer/dryer combo, and I would not hesitate to recommend it to others. It has been a lifesaver with the space savings. hi, may I know what kind of frigidaire model is this? Thank you. This washer dryer combo is great! If you're in the market for a new washer/dryer the Frigidaire Gallery Series Washer Dryer Combo is worth your consideration. We've had ours for over a year now and it still amazes me. The front load washer has an extra large capacity for those larger loads. Yet the beauty of it is that this washing machine uses only a minimal amount of water to wash your clothes. It senses the size of your load and knows exactly how much water is needed. Another nice feature is the numerous cycle selections to choose from. There's everything from Normal, to Bulky and Hand Wash. The selection is great and the display is bright and easy to navigate. The best feature by far though is the spin cycle! It's mesmerizing! It is so fast I've caught myself staring at it many times. It is such a speedy spin that often there is little drying time required. Which brings me to the second part of the Gallery Series combo...the dryer. It too has a great selection of dry cycles. Numerous settings available will take care of anything you put in it from delicates to bulky towels. And again, because amazing spin speed on the washer, the dry time is much less! Overall, I think the Frigidaire Gallery Series with its low energy and water consumption, is a very economical choice. It also offers many features, looks great and does a great job! I couldn't be happier with the Frigidaire Gallery Series Combo! I would rate it #1 with #1 being the highest rating. I love this washing machine I believe it is the largest capacity washing machine available. It is a front end loader which makes it very simple to use. It comes in a variety of colors to choose from and it is also Energy Star endorsed. It is a very quiet running machine and I would not trade it for the world.